Just listed in the fabulous building of Sea Air in Hollywood is this two bedroom/two bathroom condo. This is a breathtaking corner unit with spectacular views. This is a turnkey unit that comes fully furnished and ready to move right in. The bedrooms are generously proportioned with walk in closets. The condo is diagonally tiled throughout. The re-imagined unit has been completely updated. The kitchen is open and has beautiful white cabinets with neutral counter tops. The panoramic views of the intracoastal and ocean can be seen throughout the one thousand five hundred and fifteen square feet of beautifully appointed living space. The wrap around balcony on this corner unit makes it perfect to sit outside entertain and enjoy the South Florida breezes. This unit conveniently has a washer and dryer! Just steps to the beach this gem is all one could ask for! This building allows twelve rentals a year so it is a great investment to rent when you are not using. 3725 South Ocean Drive unit 1224 is located in Hollywood and is currently asking $495,000.00. 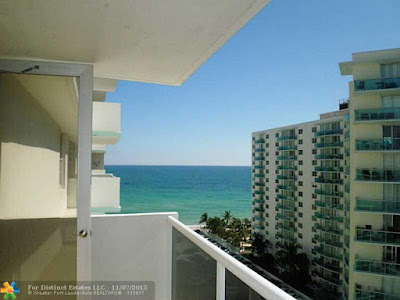 Sea Air is a beautiful condominium poised perfectly on the sun soaked shores of Hollywood Beach. Residents of Sea Air have five star amenities such as a library, pool tables, ping pong tables, air hockey tables, large screen t.v. in the new media room, card and game room, elegant ballroom, large heated pool, gym, steam rooms, laundry rooms, valet parking, Dish network channels, and recycling stations on every floor.